Sydney-based Zanny Begg’s cross-disciplinary work revolves around an investigation of the politics of space, local and global. 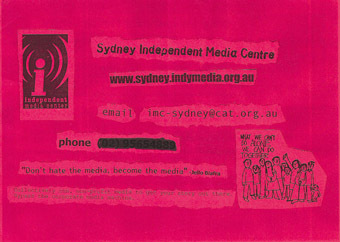 JUST OVER 10 YEARS AGO SYDNEY MEDIA ACTIVISTS RUSHED TO FINISH A VERSION OF ACTIVE SOFTWARE WHICH WOULD ENABLE THE FIRST INDYMEDIA SITE TO GO LIVE IN TIME TO COVER THE PROTESTS AGAINST THE WORLD TRADE ORGANISATION MEETING IN NOVEMBER 1999. AS RIOTS ERUPTED IN DOWNTOWN SEATTLE, MILLIONS OF PEOPLE LOGGED INTO THE NEW SITE LAUNCHING A MEDIA NETWORK WHICH REPORTEDLY RECEIVED MORE HITS IN ITS FIRST WEEK THAN MEDIA HEAVYWEIGHTS SUCH AS CNN. Brian Holmes, nettime posting November 2009. Ten years later the Indymedia network, while relatively small and fragmented in Australia, has grown to over 150 outlets around the world and has become a global phenomenon based around the simple slogan: “don’t hate the media, become the media.” A decade on it is now possible to see that Indymedia not only helped establish a global media service it also helped forge a connection between digital innovation and activism which has had a lasting impact on culture and the net. ABC social media producer John Jacobs, a member of the Jellyheads anarchist media collective whose warehouse was an infamous performance venue in the 90s, explains that the impetus for Indymedia grew out of attempts by people involved in Jellyheads, Critical Mass and the Reclaim the Streets activist communities to produce a hardcopy calendar to share news and events. Jacobs says that he knew he “never wanted to look at a photocopying machine again” when he met up with a physics student at Sydney University, Matthew Arnison. Arnison and Andrew Nicholson collaborated in writing the code for Active Sydney, a website which enabled people to share events, news, photos and other digital material online for the first time. Active showed its international networking potential when used to cover news of the J18 global street parties in June 1999. As Nicholson, who is now a freelance coder and a member of the Sydney based art collective You Are Here, explained, its breakthrough was that activists could share information in “near real time.” In the build up to the Seattle protests in November of that year the founders of Active made contact with media activists in America and helped create the first Indymedia site which was based on the existing Active software. Media analyst Marc Garcelon explains how Jeff Perlstein, a local member of the Seattle Independent Media Coalition, and another Seattle media activist, Sheri Herndon, became interested in using the internet to create an independent media network focused on the upcoming WTO protests. These activists wanted to utilise the archetype of “open-posting” developed in Australia: “after hooking up online with the Active network, the Seattle group around Perlstein and Herndon secured low-rent use of a downstairs floor in Seattle through the directors of the Low Income Housing Institute…For the next six weeks, the network transformed this space into the first Indymedia center, which became operational the day before protests began against the WTO Conference” (Marc Garcelon, “The ‘Indymedia’ Experiment: The Internet as Movement Facilitator Against Institutional Control”, Convergence 2006; 12). Indymedia’s rapid expansion was helped along by its open structure—anyone in the world could put their hand up and say that they wanted to create a local branch and they were given the domain name and someone would create a handle for them in the Active software. Nicholson describes this as a “network effect” much like the old web rings of the early days of the net where people would band together to share common interests within an autonomous and expanding web environment. Also crucial to the success of Indymedia was the notion of open publishing, something Arnison describes as ensuring “the process of creating news is transparent to the readers....” (http://purplebark.net/maffew/cat/openpub.html). John Jacobs likens Indymedia to a “big communal blog before blogs were even invented. The backbone of Indymedia was peer-to-peer moderation, user generated content and open publishing, something which would ripple out through the web as a whole.” The concept of open publishing has expanded throughout the web with popular sites like Wikipedia which rely on “swarm intelligence” to refine, edit and verify content. An obvious corollary opens up between the open architecture of the web and the open publishing tactics of the web activists of Indymedia. The desire to decentralise information production and distribution connects directly to the de-centralised packet-switching structure of how information flows through the web. The many-to-many information broadcasting nodes of the web form the base which supports an ideology of open content creation, editing and sharing which has become normative within activist and web culture more broadly. The cultural implications of this have been enormous, both for the raft of art projects which have used the web as their medium, experimenting with net conceptualist actions such as the electronic sit-ins of the Electronic Disturbance Theatre, but beyond the core of internet artists there has been a general trend towards interactivity and networked culture within art making even in non-technologically dependent projects, such as the artists loosely grouped under the banner of Relational Aesthetics. Tactical Media is a term developed by David Garcia and Geert Lovink in the late 90s to describe the possibilities for artistic and activist interventions into digital and web-based media. In creating this term they borrowed from Michel de Certeau’s celebrated book The Practice of Everyday Life which outlined the potential for ordinary people to tactically interact with consumer society. De Certeau drew a distinction between strategic interventions, which were the prerogative of those invested with power, and the wily, tactical interventions of the weak. In contrast to the grim absolutism of the Situationists (“consumer society has colonized social life”), de Certeau saw the possibilities for consumers, or rebellious users, as he preferred to call them, to recreate the value of consumer products by investing them with their own idiosyncratic uses and meanings. Garcia and Lovink explain, in a nettime posting, how this allowed de Certeau to produce a “vocabulary of tactics rich and complex enough to amount to a distinctive and recognizable aesthetic…[an] aesthetic of poaching, tricking, reading, speaking, strolling, shopping, desiring…” Since the mid to late 90s multiple groups, networks, lists and projects have evolved under the tactical media umbrella such as Institute for Applied Autonomy (1998), RTMark (1996), The Yes Men (1999), Next Five Minutes (1993), Carbon Defense League (CDL) (1998), Bernadette Corporation (1994), Beyond The Brain parties (1995), HAcktitude (2001) and so on. The tech savvy trickster has become a key figure within art as cultural activists use the avenues of communication opened up by digital media to play in the gaps and cracks in the armory of the powerful. What the internet allows is the rapid expansion and diversification of the impulse towards networking, collaboration and collectivism contained within earlier avant-garde art movements: thus Mail Art becomes the email list, detournment becomes sampling, the readymade becomes plagiarism, plagiarism becomes copyleft, the derive becomes Google-earth, the collage becomes the mash-up, appropriation becomes the fan-zine and so on. Rather than emaciating the avant-garde impulses of earlier art movements, as those who claim we live in a postmodern world might hypothesise, the internet age has put them on steroids, rapidly expanding the capacity of artists and art movements to experiment with networked practices which regard social relationships as a form of art. Experiments in the 80s and early 90s with neoism, culture jamming, cyber-punk, tactical media, net.art and hacktervism created a culture of digital resistance and critique which has transformed both art and networking, or, as Bazzichelli cogently argues, conflated the two. In Italy, where Bazzichelli is located, the digital underground is highly active and innovative spawning a multitude of networked cultural practices and initiatives such as 0100101110101101.org the Luter Blissart Project, the Telestreet network, FreakNet and so on. In Italy there has been a powerful combination of autonomist theory, digital resistance and political activism which has reverberated outwards to the rest of the world through the writing of Toni Negri, Maurizio Lazzarato, Franco Berardi and Paolo Virno and the actions of counter-globalisation protesters in Genoa. In May 2000 Naomi Klein was invited to give a paper at the Re-Imagining Politics and Society conference in New York. A central theme of this conference was providing vision and unity to the counter-globalisation movement which had emerged so spectacularly on the streets of Seattle the year before. When deliberating on her speech Klein came to the antagonistic conclusion, however, that a lack of vision or unity should be considered a strength rather than a weakness. Choosing her metaphor carefully Klein argued that while the movement had not coalesced into a single definable identity its various elements were “tightly linked to one another, much as ‘hotlinks’ connect their websites on the Internet.” She went on to explain, “This analogy is more than coincidental and is in fact key to understanding the changing nature of political organising. Although many have observed that the recent mass protests would have been impossible without the internet, what has been overlooked is how the communication technology that facilitates these campaigns is shaping the movement in its own image…What emerged on the streets of Seattle…was an activist model that mirrors the organic, decentralised, interlinked pathways of the internet—the internet come to life” (www.thenation.com/doc/20000710/klein/single). The Sydney hackers who helped launch Indymedia years ago played an important part in linking our experiences of communication and politics with the technical capacities for decentralisation embedded within the structure of the web itself. As we confront copyright, piracy, plagiarism and other issues of the digital age, the innovation of a decade ago stands as a reminder that the future of culture lies in democratising the productive capacities of the era in which we find ourselves.